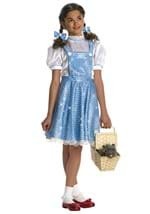 Our toddler Toddler Kansas Girl Costume Dress is a cute choice for Halloween or playtime. The girl's costume consists of a polyester blouse that ties in the back for closure. It has a white top with a blue and white gingham bottom. The short sleeves have a puffy appearance and blue ribbon lines the collar and sleeves. The gingham jumper buttons in the back for easy on and off and two faux buttons accent it. Two matching hair ties are also included.